Only the sharpest eyes would likely notice the small yellow flags out in the bird box field and along the top of the Bay View Trail. 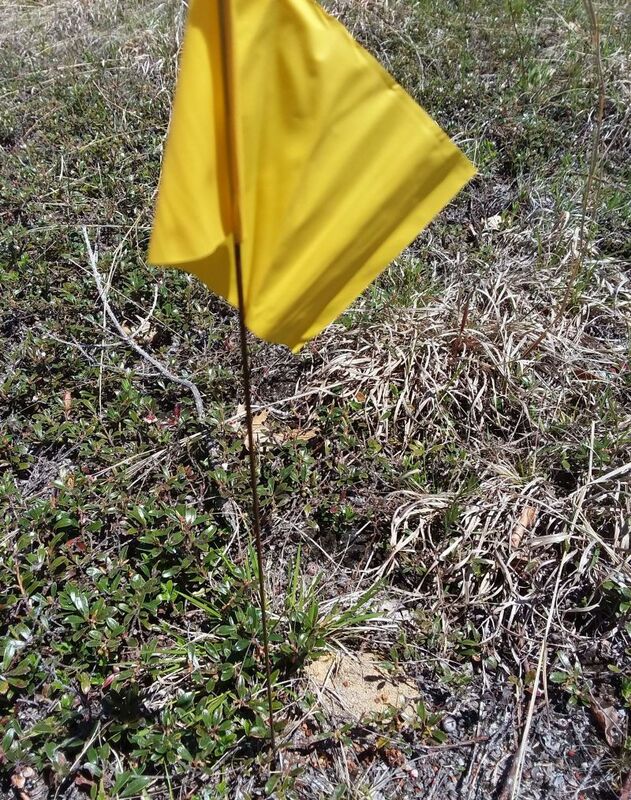 Bee researcher Nick Dorian marked this Colletes nest with a yellow flag so he can follow changes in the bees’ populations over the next few years. 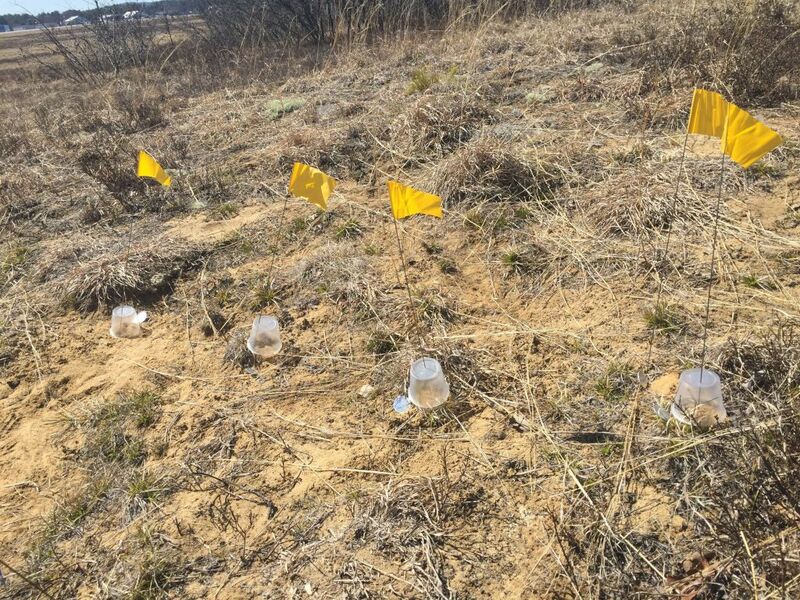 The flags were placed there by Tufts University PhD candidate Nick Dorian who’s researching two closely related species of native ground-nesting bees known as cellophane bees: specifically known as Colletes inaequalis and Colletes validus. More about why they’re called cellophane bees in a minute. 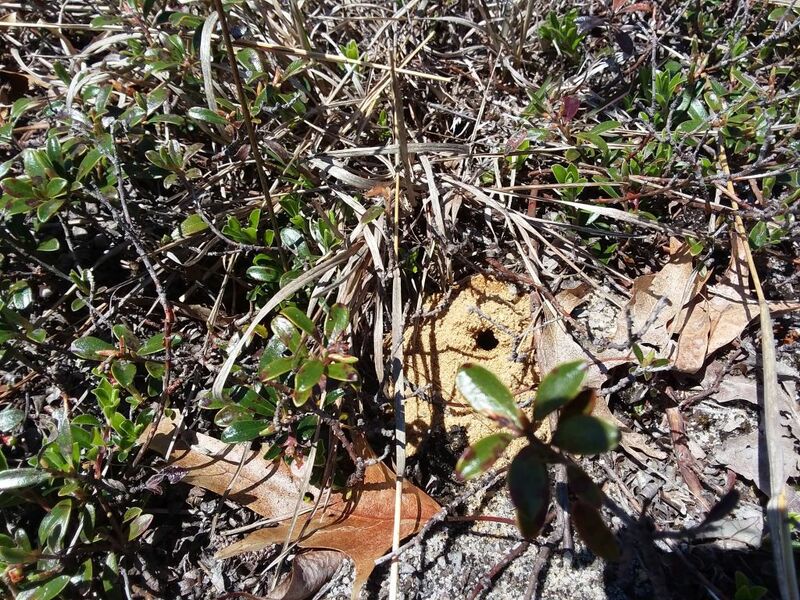 Many of us would likely mistake a Colletes nest for an ant hill, except the hole is bigger. 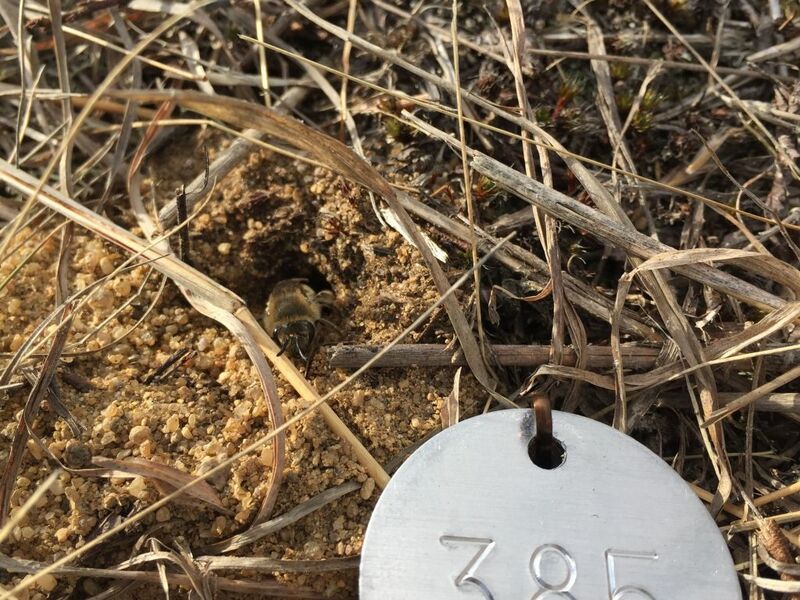 Both bee species Nick is studying can be found in pine barrens, a globally threatened ecosystem that is characterized by nutrient-poor, sandy soil. It’s not clear to what extent the bees have been impacted. 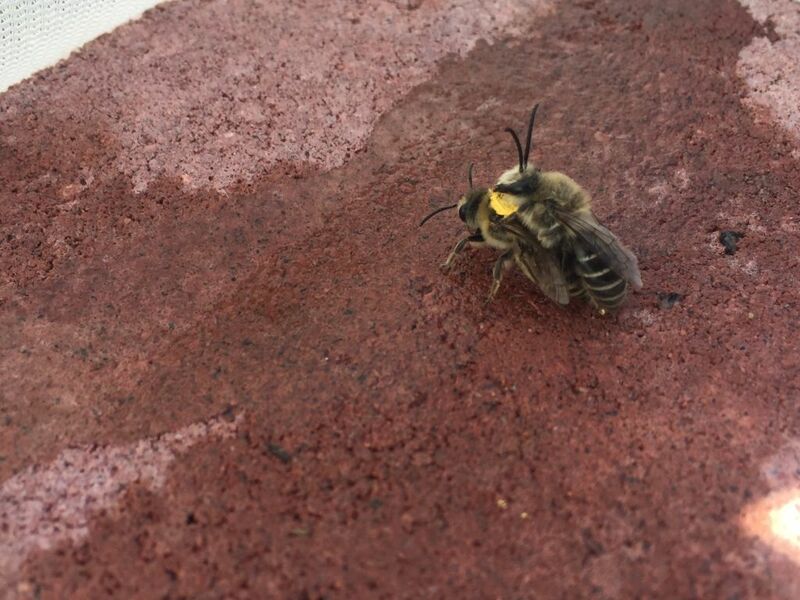 Female Colletes build their nests underground in early spring and lay their eggs inside. And here’s why they’re called cellophane bees: the name comes from the plastic-like substance the bees use to seal each egg into small water-proof cells that branch off from the main nest tunnel. Before sealing the eggs in, the female provisions them with a regurgitated “pollen soup”, a combination of nectar and pollen. The eggs hatch into larvae, which develop exclusively on the “pollen soup” that their mother left for them. Once big enough, larvae spin a cocoon and overwinter as adults in the nest . Colletes bees kick off the 2018 breeding season with the male atop the female. Males die after the breeding season, even if they never mate with a female. Note yellow dot on the female’s thorax which allows Nick to know which nesting aggregation she belongs to. Nick says he chose the two species, in part, because they tend to nest, not in colonies, but near each other. As a result, he can study a lot of bees at once: he’s monitoring 1000 nests at his main study site in New Hampshire. Just a small section of Nick’s study site. The nests are located in close proximity, which makes it easier for him to use plastic cups to keep bees from re-entering the nest just long enough to safely capture, mark them, and release them. Because the nests are near one another, Nick can capture the females as they come and go, marking them with numbers for tracking. He also takes a sample from their pollen sacks so he can determine the plants they’ve been visiting. Colletes inaequalis (Unequal Cellophane Bee) emerges from her nest, marked # 385. Because so little research has been done on the two species, there is a lot to learn about C. inaequalis and C. validus. For instance—how many nests an individual female builds and what success her offspring have. Also, C. inaequalis is a generalist when it comes to foraging; C. validus forages exclusively on blueberries and nests only near that plant. “One thing I’ll be looking at is the differences in population growth rates between a floral generalist and a specialist,” Nick says. He’s already had one potentially intriguing observation here at the sanctuary: a C. validus nest that was not located near a blueberry bush but instead bearberry (which is related to blueberry). Is it possible this blueberry specialist may actually forage on other plants? It’s too soon to say but it’s one of many things Nick will be watching when his field work resumes next spring! Nick at his native bee study site in New Hampshire (photo by Max McCarthy). Our thanks to Nick Dorian for the photos and for all his assistance with this post. Nick, a man of many scientific interests, also volunteers at Wellfleet Bay’s bird banding station. This entry was posted in Updates on June 27, 2018 by Wellfleet Bay. We have forwarded your comment to Nick. I’m sure he’ll enjoy hearing about your bee aggregation!! We’ll forward back his reply. Nick, I believe I have a large grouping under my deck here in East Orleans near both Bearberry and Blueberry plants. I always wondered what they were but it seemed a short season and the bees never bothered me so I just let all be. Next year I will pay more attention and send you photos if indeed they are the bee of interest. This colony has been here at least 7 or 8 years as my youngest is allergic to bees and I would make him stay away from this area. I am a landscape designer and my yard has extensive native plantings so it is encouraging to think I may have attracted them!! !